This sweater has our mouth watering. A WAK collaboration with Santa Pazienzia, we’re reaching for our hooks pronto. 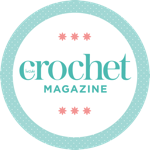 The lovely folks at We are Knitters are giving away one of their kits (worth £85!) to a lucky reader.